For more information about ORTHOLOC 3Di Small Bone Plating System, please visit http://www.wright.com/footandankleproducts/ortholoc-3di-small-bone-plating-system. 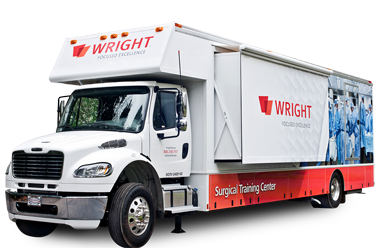 More information on Wright Medical’s products can be found at www.wright.com. Syndesmosis fixation is necessary when patients suffer from ankle trauma, including fractures, which often cause damage to the fibular and tibular syndesmosis ligaments. In order for the ligaments to heal properly, the fibula and tibia bones must be stabilized. It is estimated that over 145,000 ankle fractures occur each year in the United States, a number that is growing by 10% annually due to an aging population (SmartTrak 2017). For more information about SYNCHFIX, visit: http://www.wright.com/footandankleproducts/gravity-synchfix-syndesmosis-fixation-device. Of the roughly 50,000 end-stage ankle arthritis patients in the US each year, an estimated 8,000 will receive a total ankle replacement in 2017 and the rest will receive an ankle fusion or conservative care. With an ankle fusion, patients undergo a surgical operation where screws or plates are used to join or “fuse” the bones of the tibia and the talus in order to create a solid and immobile ankle joint with the goal to alleviate pain. Patients who receive a total ankle replacement undergo a surgical operation where ankle replacement implants are used to resurface the ends of the tibia and talus that have been damaged from ankle arthritis, with the intent to help alleviate pain and maintain mobility in the ankle joint. The INFINITY™ Total Ankle System is intended to give a patient limited mobility by reducing pain, restoring alignment and replacing the flexion and extension movement in the ankle joint. Individual results and activity levels after surgery vary and depend on many factors including age, weight and prior activity level. There are risks and recovery times associated with surgery and there are certain individuals who should not undergo surgery. 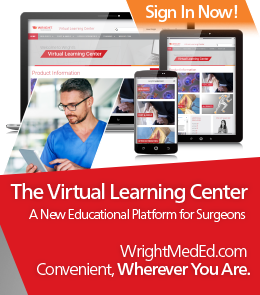 More information on Wright Medical’s products can be found at www.wright.com. Charcot Foot is a serious condition that results from neuropathy, usually the result of diabetes. This condition results in the breakdown of the foot inflammation and damage affecting joints, bones, and soft tissues of the foot. Studies have suggested that as many as 13% of all diabetic patients and 29% of neuropathic patients may be affected with this condition. In the U.S., there are an estimated 51,000 new Charcot patients per year. The SALVATION™ External Fixation System is designed to address fractures, nonunions, and complex foot and ankle deformities including Charcot neuroarthropathy. The system relies on proven techniques utilizing tensioned thin wires, half-pins and rings. The SALVATION External Fixation System incorporates many new features to assist with proper frame positioning and increase frame application efficiency. The slotted ring design allows for frame components to be attached quickly and easily, while minimizing the need to assemble small, threaded components together. The system includes components to assist in the positioning of the foot and lower leg within the frame and maintaining appropriate position throughout the surgery. In addition, the Wire Guide allows for precise placement of the wire on the ring to minimize the need for additional connection components and decrease additional surgical steps. The SALVATION External Fixation System may be used for definitive treatment as the sole fixation device, or used in conjunction with the SALVATION Beams and Bolts or the SALVATION 3Di Midfoot Plating System. For more information about SALVATION, visit: http://www.wright.com/healthcare-professionals/salvation/salvation-external-fixation-system.